This news came in yesterday evening, a new Linde Werdelin Oktopus model with a Moonphase Complication. The Oktopus was introduced during BaselWorld 2009 and during my interview with them I was able to fiddle around with it a bit. The bezel with embossed numerals reminded me a bit about my precious Rolex Yacht-Master, and which I therefore really like. This new titanium Oktopus features a solid rose gold bezel, together with the moonphase complication the ultimate luxury diving watch. If you have a pale skin like me, you know you have to stay away from gold watches. However, a rose gold bezel on a titanium case will suit you fine. It is actually the only possibility for me to wear a gold watch. Also this time, Morten Linde and Jorn Werdelin got help from Svend Andersen (like he did with the SpidoLite SA models) to work on the complicated automatic movement based on Frederic Piguet caliber 1150. The moon disc is made out of Super Luminova, which will make sure it is visible during every time of the day (or night). Svend Andersen built this moonphase complication based on the date feature of the Piguet movement, allowing to show a countdown to the next full moon. The transparent sapphire case back of the Oktopus reveals the Andersen-modified Piguet movement. The titanium watch is water resistant to 888 meters and includes an automatic helium escape valve located on 9 o’clock in the case. 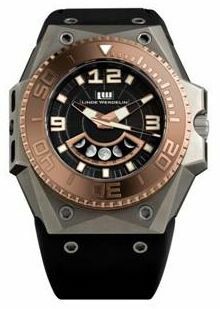 Normally, Linde Werdelin watches are limited to either 22, 44, 88 or 222 pieces each. However, the LW Oktopus is also a bit different in this aspect. It is limited to 29 pieces, connoting to the days before the next full moon. The Oktopus Moonphase Complication will be available for pre-order in September 2010.